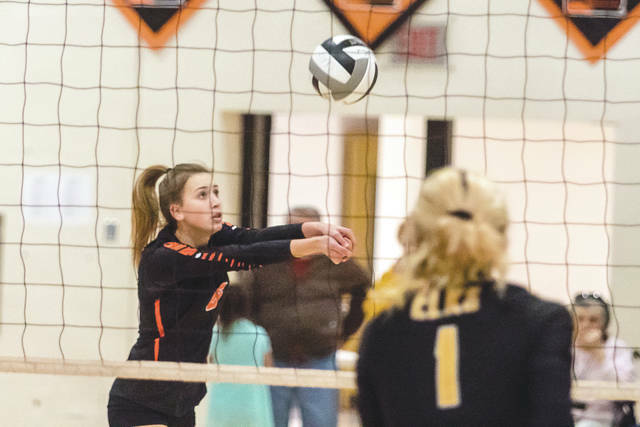 BEAVERCREEK — The visiting Centerville Elks claimed a 25-15, 18-25, 25-16, 25-19 win over the previously unbeaten Beavers of Beavercreek, Sept. 7 in a rowdy BHS gymnasium. With the Beavercreek student section screaming at one end, and the Centerville junior varsity players matching them with enthusiasm and cheers from the other, each talented team pounced on the other’s miscues. On this night, Beavercreek made a few more serve-receive miscues. “I think the difference was their seasoning,” Beavercreek coach Tim Green said. “They’ve got a lot of players who have had high-level playing experience in this type of atmosphere. We have some players coming back from last year, but a lot of them have not played in that type of environment before. The first set saw Centerville (9-0, 4-0 Greater Western Ohio Conference National East) grab the lead for good at 7-6 on a Danielle Sargent spike down the middle. A mix of dinks and misdirection hits and a block by senior rightside hitter Sydnee Johnson helped the Elks leap to a 10-point margin, at 23-13. A pair of Beaver miscues — deep serve and a hit that sailed wide right and out of bounds — gave the opening set to Centerville. The second set was knotted up at 12-12 when Kelly Goenaga-Lask and Sarah Laughman combined for five kills and a pair of blocks to grab the lead for good for Beavercreek (9-1, 3-1). A defensive gem by Hanna Lefevers and Sara Skaggs enabled the Beavers to grab a 24-16 lead. Centerville pecked away at the lead, pulling to 24-18 on a Sydnee Johnson block, but Lefevers’ kill earned Beavercreek the second-set win. The two teams then were tied at 6-6 and 7-7 before the Elks’ MacKenzie Conner, Johnson and Brianna Strayer combined to put Centerville out in front for good at 15-9 in the third set. Centerville outscored Beavercreek, 10-6 the rest of the way to grab a two sets to one lead. The fourth set started out even, but at 3-all the Elks’ Sydnee Johnson bombed an ace serve and the Beavers seemed to come momentarily unraveled. Centerville racked up five consecutive points off Beavercreek hits into the net or serve return errors. Johnson hit two aces during the run. The Beavers pulled to within three points (18-21) on a pair of Elks errors but then kills and a service ace by Remy Gerken, and then a kill each by Scottee and Sydnee Johnson, combined with a Beavercreek shot out of bounds, gave the set and match to Centerville. Unofficially, Kelly and Lauren Goenaga-Lask each had seven kills a block and an ace, Hanna Lefevers had five kills and two blocks, Abby Hack had five kills and one block, and Laughman led the team with seven kills and three blocks. For Centerville, Sydnee Johnson’s unofficial stats led the way with eight kills, four blocks and a pair of service aces. Conner finished with seven kills and Gerken had eight kills and a block. Beavercreek next plays at 7 p.m. Monday Sept. 11 at Troy, while Centerville has a noon match on Saturday at home against Liberty Township Lakota East. Sarah Laughman and Kelly Goenaga-Lask go up for a block attempt on a shot by Centerville’s Scottee Johnson, during Thursday’s Sept. 7 girls high school volleyball match at Beavercreek High School. Centerville won the match in four sets. 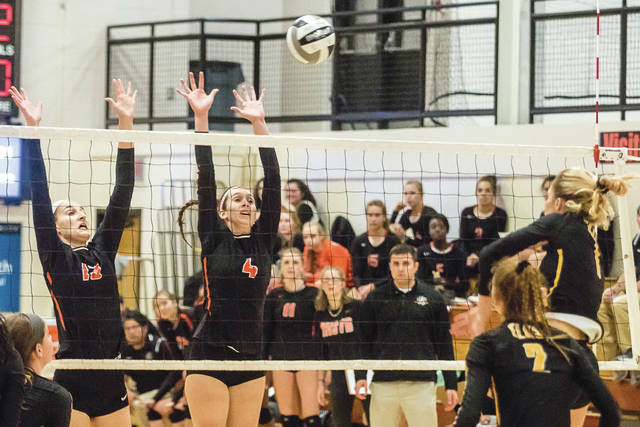 Beavercreek’s Lauren Goenaga-Lask (6) bumps the ball over the net during Thursday’s Greater Western Ohio Conference battle of National East division unbeatens at Beavercreek High. Beavercreek senior setter Kaylee Fugate makes a diving save of the ball in Thursday’s Sept. 7 match against Centerville.